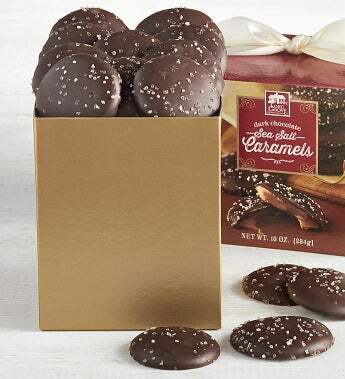 True chocolate cravers will not be able to resist these creamy soft hand crafted caramel drops covered in rich dark chocolate and sprinkled with pure fleur de sel - sea salt. Long Grove Confectionery has individually wrapped each piece for sharing and freshness. The caramel made with fresh cream and butter is beyond compare and pairs deliciously with the premium dark chocolate coating. freshest and best quality ingredients in their artisan-inspired chocolates & confections. Gift Measures 4.5" x 4.5" x 6.5"
True chocolate cravers will not be able to resist these creamy soft hand crafted caramel drops covered in rich dark chocolate and sprinkled with pure fleur de sel - sea salt. Long Grove Confectionery has individually wrapped each piece for sharing and freshness. The caramel made with fresh cream and butter is beyond compare and pairs deliciously with the premium dark chocolate coating. Beautifully presented in a handsome red and gold gift box with ivory ribbon.